MELISMATIC: WATCH THIS: Fall Out Boy & Demi Lovato find *NSYNC "Irresistible"
WATCH THIS: Fall Out Boy & Demi Lovato find *NSYNC "Irresistible"
In case you might not yet have heard -- the year 2015 will go down in history with a very special footnote that is dear to my heart. It's the year that *NSYNC's reign as Kings of One Week Album Sales officially ended thanks to a little known lass named Adele (perhaps you've heard of her). 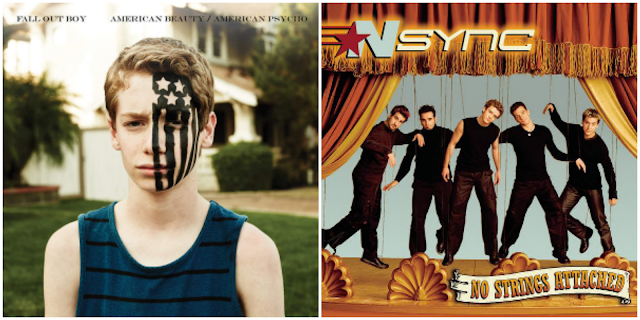 2015 was also very good to the boys in Fall Out Boy. Their sixth full album release, American Beauty / American Psycho had much longer legs than anyone really expected. It was released about a year ago in January of 2015 -- a normally pretty dormant time for album releases -- and it was, in my opinion, their most solid album release yet. It featured hype single "Centuries", namesake "American Beauty/American Psycho", the everywhere earworm "Uma Thurman", futuristic "Immortals" was in Big Hero 6 (at the end of 2014), and now the group is continuing the hot streak with a re-cut version of the album's opening track, "Irresistible", with a little help from Demi Lovato. The music video just dropped and it patterns its concept in homage to *NSYNC's "It's Gonna Be Me" music video with a personal twist. For those of you who aren't boy band supernerds, that particular little ditty was actually *NSYNC's sole #1 hit on the Billboard Hot 100 and was the second release from the group's now iconic No Strings Attached album in 2000, also known as the album that Adele's 25 just pushed aside for the most copies sold in the shortest span. The song was another Max Martin-penned smash (fast forward and the man's still crafting hit after hit) and featured the five members posing as (admittedly kinda creepy) dolls on a store shelf. It was a not-so-subtle allusion to the overall statement of naming their sophomore album No Strings Attached. They had escaped the clutches of Lou Pearlman, they had jumped labels to the Cool Kids in Pop party at Jive Records (also home of Backstreet Boys and Britney Spears at the time), and were pretty damn adamant in quoting Pinocchio by addressing the haters to say they "got no strings to hold [me] down". That's right, boys & girls -- long before Zayn was giving interviews about how he felt stifled because One Direction was too under its handlers thumb, my heartthrobs were making jokes about being products themselves. Not only was the premiere of the above video an event in my young life -- watching the MTV "Making the Video" half hour docu-special was one, too. Remember when MTV actually aired programs about music? Good times. Now here we are, almost sixteen years later (yikes, I'm old) and Fall Out Boy not only bagged the original director of the "It's Gonna Be Me" video for the "Irresistible" vid treatment -- Wayne Isham (who also directed "Bye Bye Bye") -- but offered Chris Kirkpatrick and Joey Fatone cameos. Those terrifying actual *NSYNC dolls that were sold in stores in 2000 also made appearance, complete in their original packaging. If you're silently asking if I had one of those dolls, the answer is obviously yes. And obviously I had Justin. Put it this way: Demi Lovato was barely 8 years old when "It's Gonna Be Me" hit television screens (and would join the cast of Barney & Friends with pal Selena Gomez two years later). It's official -- my teenage obsession is now the stuff of pop culture nostalgia.